In this three-hour presentation, Richard Nixon's life and political career are reassessed primarily by those who knew him best. The program chronicles his life from boyhood in Yorba Linda, California, through his days as a young Congressman to his presidency where he astounded the nation with his foreign policy initiatives and then left office in disgrace. 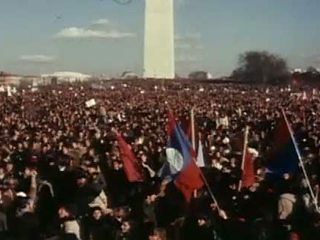 Chicago: “American Experience; Nixon; Moratorium, Vietnam protest, 1969,” 11/15/1969, WGBH Media Library & Archives, accessed April 20, 2019, http://openvault.wgbh.org/catalog/V_802B2BC4CE8F4AEAAB98A152B569B397. MLA: “American Experience; Nixon; Moratorium, Vietnam protest, 1969.” 11/15/1969. WGBH Media Library & Archives. Web. April 20, 2019. <http://openvault.wgbh.org/catalog/V_802B2BC4CE8F4AEAAB98A152B569B397>.